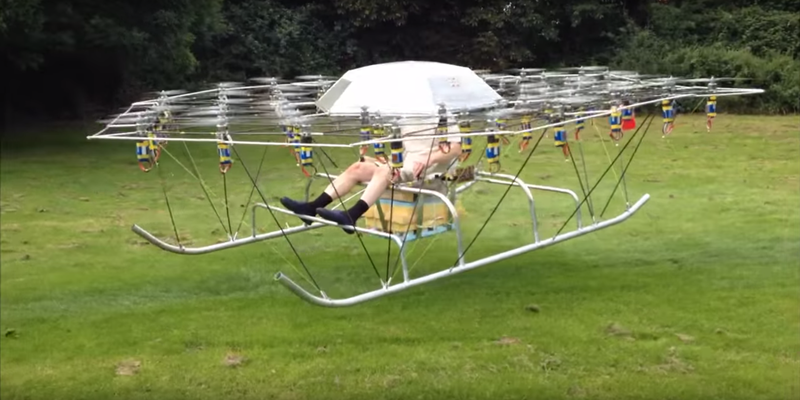 A youtuber (gasturbine101) built a manned drone prototype powered by 54 rotors equipped with small battery packs. He posted a video of a 6 minute test flight last week. gasturbine101 says the 148 kg vehicle cost him ~£6000 to build. He used an unusual design with 54 18 in counter-rotation propellers powered by 4-cell batteries. The youtuber says he installed the motors, batteries and ESC close together to reduce weight by minimizing wiring. He thinks of adding a tail rotor to improve yaw authority.